Drilled shafts have been used in the US for more than 100 years in bridges and buildings as a deep foundation alternative. For many of these applications, the drilled shafts were designed using the Working Stress Design (WSD) approach. Even though WSD has been used successfully in the past, a move toward Load Resistance Factor Design (LRFD) for foundation applications began when the Federal Highway Administration (FHWA) issued a policy memorandum on June 28, 2000.The policy memorandum requires all new bridges initiated after October 1, 2007, to be designed according to the LRFD approach. This ensures compatibility between the superstructure and substructure designs, and provides a means of consistently incorporating sources of uncertainty into each load and resistance component. Regionally-calibrated LRFD resistance factors are permitted by the American Association of State Highway and Transportation Officials (AASHTO) to improve the economy and competitiveness of drilled shafts. 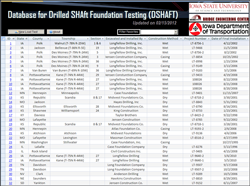 To achieve this goal, a database for Drilled SHAft Foundation Testing (DSHAFT) has been developed. DSHAFT is aimed at assimilating high quality drilled shaft test data from Iowa and the surrounding regions, and identifying the need for further tests in suitable soil profiles. This report introduces DSHAFT and demonstrates its features and capabilities, such as an easy-to-use storage and sharing tool for providing access to key information (e.g., soil classification details and cross-hole sonic logging reports). DSHAFT embodies a model for effective, regional LRFD calibration procedures consistent with PIle LOad Test (PILOT) database, which contains driven pile load tests accumulated from the state of Iowa. PILOT is now available for broader use at the project website: http://srg.cce.iastate.edu/lrfd/. DSHAFT, available in electronic form at http://srg.cce.iastate.edu/dshaft/, is currently comprised of 32 separate load tests provided by Illinois, Iowa, Minnesota, Missouri and Nebraska state departments of transportation and/or department of roads. In addition to serving as a manual for DSHAFT and providing a summary of the available data, this report provides a preliminary analysis of the load test data from Iowa, and will open up opportunities for others to share their data through this quality–assured process, thereby providing a platform to improve LRFD approach to drilled shafts, especially in the Midwest region.